In the mid 1970s Melbourne, zucchini (courgette) was the vegetable de jour, exotic in the shop, bland and boring on the average home dinner tabIe. The other problem was that by the time everyone had realised that zucchini grew at an extraordinarily rapid rate, every backyard vegie plot had been planted with them. What to do with large zucchini which you can’t even give away? Women’s magazine devoted pages to zucchini recipes. Only a few have become household favourites, zucchini bread, zucchini soup and zucchini slice. It’s from the Women’s Weekly zucchini slice that my savoury vegetable cake has evolved. The original zucchini slice was fairly bland, relying on bacon and cheese for flavour, the texture was soft and slightly rubbery, but the concept had potential. Basically this is a savoury cake, good to serve hot or cold for breakfast, lunch or dinner, it’s more substantial than frittata and has less fat than quiche. My vegie slice makes a great sandwich filling when sliced thinly or hors d’ouevre when cut into small squares. It is a great summer standby to bake in the cool of the day, chill, then enjoy with salad. The quantities given will make a large cake to serve 6. It delicious with a dob of aoli. A food processor with shredding blades make this quick and easy to make. Preheat the oven to 170C. Grease and line a deep 25cm pie dish. Hand chop the red capsicum and spring onions, blitz the parsley and garlic briefly. Change the blade on the processor, then coarsely shred the carrot, zucchini, pumpkin, potatoes and cheese. Combine all the vegetables, cheese, flour and eggs in a large bowl, stirring thoroughly to combine. If the mixture is too stiff or dry, add a little milk. Season with sea salt and a generous grinding of black pepper. Tip the vegetable mixture into the prepared pie dish, spread to the edges and smooth the top. Bake in a moderate oven for about 50 minutes until cooked through. The centre should be firm and will spring back when touched. 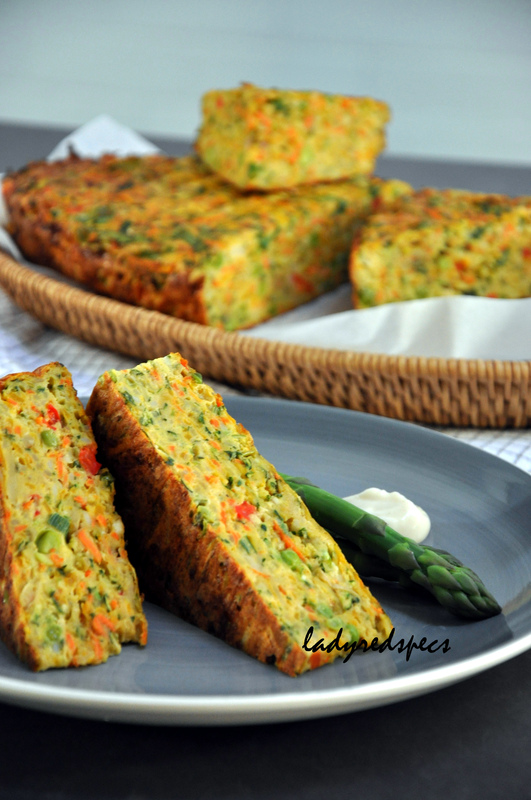 Allow the Savoury Vegetable Cake to rest for 5 minutes before turning out to serve, or cool on a paper lined wire rack. Sandra,I am planning to make this lovely looking Vegetable Cake for a family get together. One member, I am not going to name names, is allergic to cheese. What can I replace the ingredient with? This entry was posted on November 30, 2012 by ladyredspecs in Baking, Breakfast and Brunch, Food, Light Savoury Dishes, Main Meals, Savoury Baking, Vegan, Vegetarian and tagged bake, eggs, vegetables.